It seems as though Android-powered gaming consoles are pretty much a dime a dozen these days, whether they be the HDMI dongle variant or a full standalone console that you place next to your TV. Either way, most of them are all the same, some offering better hardware than others, while others offer better developer support, etc. Either way, at least to me, none have really been all that intriguing to look at. Sorry, OUYA, but I’m hard to impress. 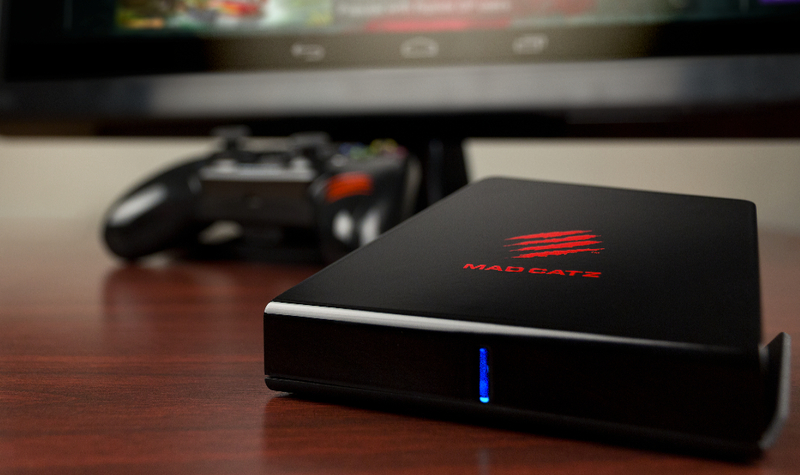 The newest console to soon hit the market is the Mad Catz Project M.O.J.O. console. Like all the others, it allows players to access their already existing titles through Google Play and play them directly through an HDMI port to their big screen TV. At least for me, there are two major differences between the M.O.J.O. and the competition. Number one being that this device is compatible with the Mad Catz lineup of full-sized controllers, which look and feel very much like the Xbox 360 controllers. I don’t know about you, but gaming takes on a whole other level once you get a real controller in your hand. Other controllers that are thin and don’t take up the full size of my hands just feel flimsy and cheap. The second and maybe not-so-important reason that this console looks intriguing is its looks. A plain black box with that single blue LED line down the front. The console itself looks to be angled, another huge turn on for a design perspective, much more appealing that just a tiny box or some dongle you will never see. Either way, that could be personal preference, but it’s good to know that one of these Android consoles can actually excite me. The device will be available starting sometime in Q4 and there is no word on exact specs yet. Let’s hope they’re decent. Any thoughts on Android-powered gaming consoles? Love ’em? Hate ’em? Share your thoughts down below.